Lawyers risk discipline for using traditional marketing tactics to reach prospective clients. The rules of professional conduct are replete with restrictions on marketing, advertising, solicitation, the use of social media, and more. The bar associations making rules for lawyers generally are imposing restrictions on traditional, normal and reasonable business tactics to educate one's target market and prospective clients about legal services available to help address clients' challenges. Communication to prospective users of these services should be restricted only by truth, fairness and honesty, not outdated concepts of the guild that seek to protect the vested interests of those who already "have it made." Now it appears that some lawyers may have had enough. As reported in the New York Law Journal and summarized in the ABA Journal, the Florida Bar (which imposes some of the strictest regulations in the country on lawyer advertising) has run into a "firestorm" of objections from law firms, the ACLU and the Federal Trade Commission over its attempts to make those rules even tougher. The rules proposed to ban online testimonials, summaries of case results and "deceptive, misleading, manipulative" or confusing audio or visual content, resulted in protests that such restrictions are overly vague and unfair. The Florida Bar offered a "compromise" that would allow existing web sites to be viewed if visitors clicked through a disclaimer process and double-click barrier in order to get useful information about legal services. When major law firms protested loudly, the Bar put off its July 1 implementation deadline and is allowing lawyers to submit comments through mid-August for further modifying the rules. It is one thing to regulate for truth and fairness in promotional statements, and to restrict hyperbole so as not to create false expectations. It is another thing to say how the communication can be framed, create vague restrictions on what can and cannot be said, and impose physical restrictions on information that should be freely available. The Bar seeks to regulate lawyers in ways that other professional associations do not, would not and could not. The losers are small firms and sole practitioners - and those clients who would benefit from learning about them. Unlike the proverbial bird in a gilded cage, which can sing but not fly, lawyers have built for themselves a "guilded" cage in which the ancient, anti-competitive outlook of a guild mentality keep competitive lawyers from both singing (communicating with prospects) and flying (earning a living as they think best). The Florida experience shows that competitive pressures may soon break that cage open. We are now set, our faculty having been confirmed, for the 2nd annual Midwest Law Firm Management Conference, to be presented by West LegalEdcenter, co-sponsored by LawBiz®, and chaired by me. Save the date: September 21, 2010, from 8:30 a.m. to 5:00 p.m. The faculty is outstanding, and the subject matter hits the major buttons of the current legal economy. One idea from this conference can earn you or save you thousands of dollars—money in your pocket! Be sure to show up or your competitors will gain the advantage. Call me now for more information. P.S. 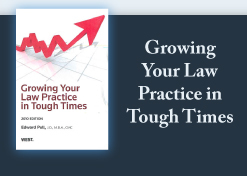 Thank you for your responses to our new rendition of LawBiz®'s web site.